Havoc runs through the first leg of Asia Pacific Rally Championship (APRC) Malaysian Rally 2011 when many top contenders crashed out of the competition. Heavy rain before dawn meant that the gravel road of Tai Tak palm oil estate becomes slippery and surprised the front runners. 4-time APRC champion Cody Crocker were the first casualties when he plunged into a ditch in SS2. His return from one year hiatus ending on a bad note, but his car were not heavily damaged and will return for the second day on superrally rules. Akira Bamba in Proton Satria Neo of Proton Cusco Rally Team. 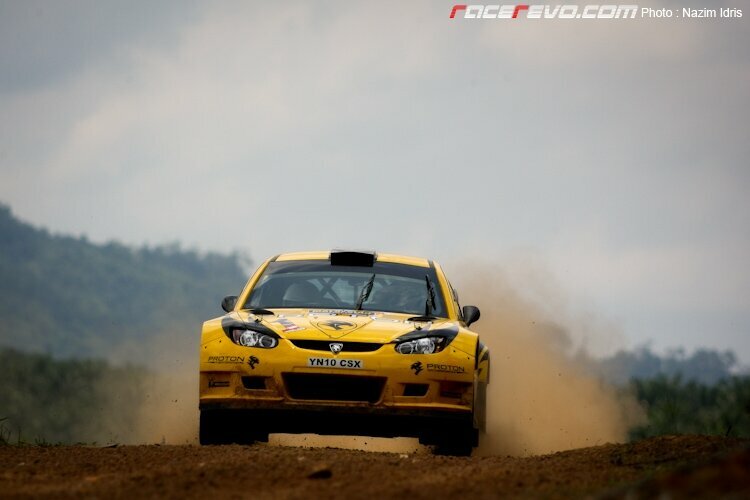 Defending champion Katsu Taguchi then hit a rock in SS3, ending his chance to earn back to back victories in Malaysia. This is the second time in three years that Taguchi failed to finish in Malaysia. Pertamina Cusco Racing duo Yuya Sumiyama and Rifat Sungkar also joined the DNF list, which includes Malaysia hopefuls Karamjit Singh and Saladin Mazlan. With that MRU Motorsports duo Brian Green and Rafiq Udhaya seized the initiative and moved up on the ranking. Rafiq Udhaya prepares to attack the special stages. But there were no problems for Chris Atkinson of PROTON R3 Malaysia Rally Team as he conquers 5 out of 8 stages to assume the overall lead. The former WRC driver were in fine form and quickly adjusted to the changing conditions. Sole remaining driver of Team MRF, Gaurav Gill was close behind in second place with 1’40.4s behind Atkinson. He looked more like a man possessed after attacking the course with full force trying to close the gap to Atkinson. Atkinson’s teammate Alister McRae occupies 3rd spot on the overall timesheet, after being slowed down by overheating of his Proton Satria Neo S2000. 2nd leg of Malaysian Rally 2011 will commence on Sunday from SS9 to SS15. With the weather becoming unpredictable more actions and surprises awaits rally fans as we head to the final seven stages of the competition.